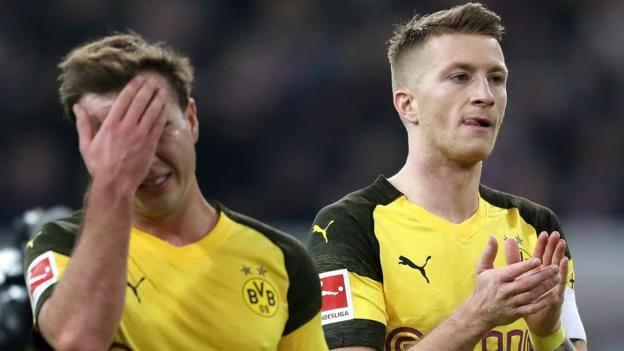 Borussia Dortmund’s power of recovery comes under scrutiny when the Bundesliga leaders welcome Borussia Moenchengladbach to Signal Iduna Park. On Tuesday night Lucien Favre’s stylists were ambushed 2-1 by newcomers Fortuna Dusseldorf, which reduced their advantage atop the league table to six points. Dieter Klaus Hecking’s go getters were the principal beneficiaries along with Niko Kovac’s Bayern Munich, as both sides won home rubbers with Nuremberg and RB Leipzig to crank up the pressure on the previously unbeaten Dortmund. No holds barred action is anticipated in Dortmund as the two sides boast some of the division’s leading marksmen. Favre fully expects tag team partners Paco Alcacer and Marco Reus who have plundered 23 goals between them to restore the Black and Yellow’s battered pride, whereas Frenchman Alassane Plea and Belgian Thorgan Hazard will carry Gladbach’s goal threat. In Germany’s financial capital, Kovac will demand that Bayern Munich retain their new found defensive discipline when they confront an Eintracht Frankfurt side he coached to cup success last season. The champions star studded back line of Manuel Neuer, Matt Hummels and Jerome Boateng must maintain maximum concentration if they are to contain Eintracht Frankfurt’s lethal attacking triumvirate of Luka Jovic, Sebastian Haller and Ante Rebic. A goals deluge is also expected at the Bayer Arena where Heikko Herrlich’s improving Bayer Leverkusen confront Hertha Berlin. The hosts suffered an indifferent start to the campaign but moved into the top half of the division following Wednesday’s gutsy 2-1 win away to Schalke.